Um, really? You laid it there? Our birds are young, so I give them a bit of leeway when it comes do trying out new things. Take laying eggs. After installing our next box, we added some golf balls to show them where they are supposed to lay similarly shaped items should they have the urge to lay an egg. So far, two of our birds have laid eggs. We know one of them thanks to the lovely greenish eggs laid by Betsy Ross, the Americana, also known as as an "Easter egger." We have found an egg in the middle of the chicken coop on the floor. This one, for example, is not in proximity to any golf balls. Ok, oops, and it hasn't happened again. Look where I found an egg recently! We know who laid this egg due to it's color, Prissy is the only brown egger who is currently laying. So, why on the ramp? Our current speculation is that she was laying in the next box when something disturbed here and she scurried out. On her way down the ramp it kinda fell out. 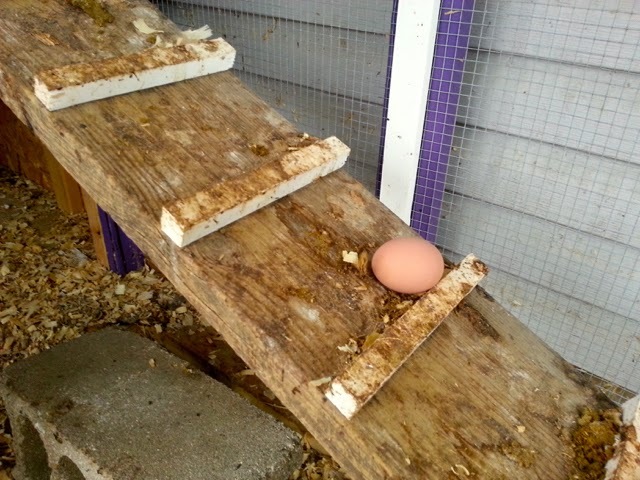 A little evidence to our far-fetched guess as to why this egg was laid on the ramp is that it was broken when I picked it up. 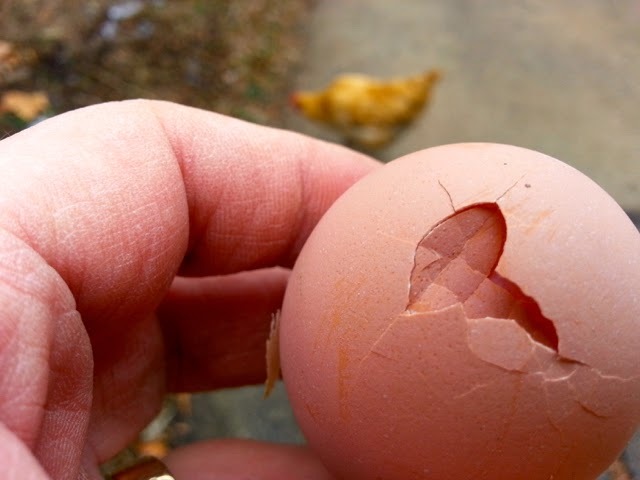 The laying process doesn't tend to break eggs, my thought is that she "dropped" the egg on the run and cracked it. Our chicken run floor is made up of a foot of sand and gravel, topped by a few inches of wood chips. There isn't any dirt for them to have a nice dust bath in. Dust bath? Apparently dust is good for their feathers, and helps reduce mites. When we let them out, the chickens often spend a lot of time next to Matt and Marissa's house where there is a nice patch of loose, dry dirt. I enjoyed watching them have some "spa time." I haven't been drawn to New Year Resolutions in the past, but I have often been drawn to the idea of doing a project over the course of a year and recording the successes and mishaps along the way. You've seen them, such as the well-known book and movie Julie and Julia where the character aspires to cook all 524 recipes in Child's cookbook in 365 days. Have you seen the poster, "How to build community?" I came across a similar version a year ago and it spoke to me. Actually, it shouted at me and said "Do these things." So I made several copies of it, put it on the fridge, and haven't done much with it yet. Do you know how hard it is to catch the mail carrier to talk with him or her? So, in a fit of unbridled enthusiasm, the other day I declared to Jay (and now to you) my intention to tackle this recipe for community building, and you, dear readers, get to join in on the ride. From successes to pitfalls, my goal is to not only do these things, but write about them as well. "What does this have to do with urban farming?" Everything, as far as I can tell, because nothing I've done so far, from building the orchard to raising chicks to building a coop has been done on my own. This has all been done in and with the communities around me. So if these wonderful things happened thanks to what I do naturally, what's possible with some actual thought and effort? In September, I opened the chicken coop door and crouched in it to video the chickens in the run (their screened in porch). I wondered how far out of the way I'd have to get before they scurried past me into the yard. You'll see from the video that it didn't take much space for them to screw up the courage to dart past me! The video was taken in September, but even now in December they love getting out in to the yard. We'll see what happens when we have snow, that will be some entertaining video! 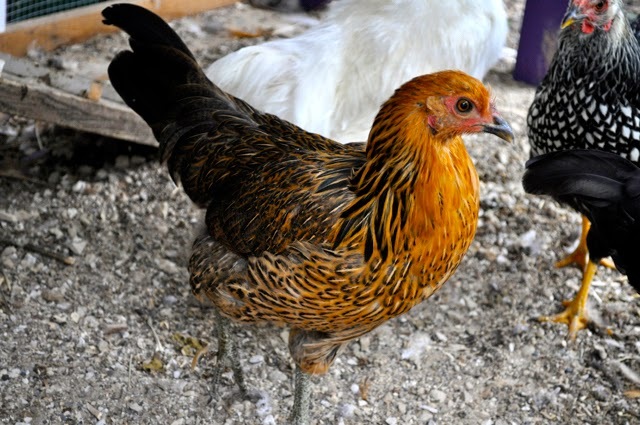 Our chickens are too young to molt - a period of time when they lose their feather and grow in a shiny new coat. When they molt, their bodies put all its work into creating new feathers so the bird stop laying eggs. A friend of mine at work recently stopped by my desk to share something. She buys eggs from a neighbor's daughter. 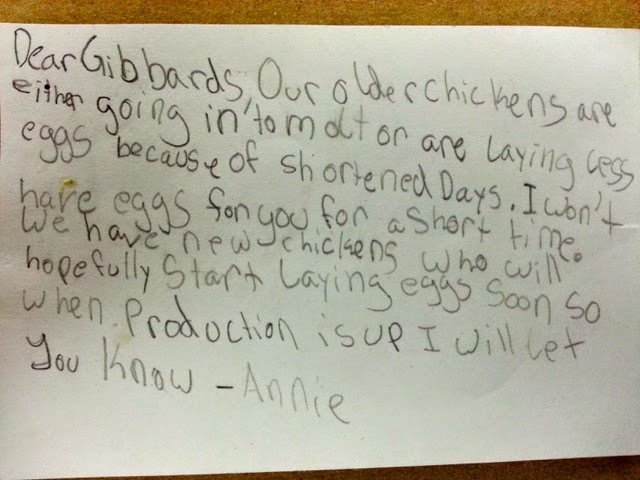 Peg recently received the following explanation of why she won't be getting eggs for a while longer. During the third Sunday of Advent, the sermon was about the Christmas story from the animals' point of view. Who knew the donkey, sheep and cow would have had such opinions about smelly, travel-worn humans moving into their stable. And you'll have to ask them what happened right before the baby Jesus was laid in amongst their food. If you'd like to hear what they thought, the sermon archive is online and I think you'll be rather amused by it. Dec. 14, 2014 sermon. "Animals are reliable, many full of love, true in their affections, predictable in their actions, grateful and loyal. Difficult standards for people to live up to," Alfred A. Montapert. During the last few months as I've gotten more and more used to and even accustomed to having these four birds, these four lifeforms, in our lives, I've found myself saying "I had no idea how much I'd like them." When I return home from work, before I step in the house, I go to the coop and visit with them. At this time of year, the day is nearly spent by 4:45 p.m. and the birds are already on their perch getting ready for sleep. I talk with them, pet the bird nearest the window and generally forget about everything else for those moments. Chickens really are very relaxing to watch and be around. As we were building our chicken coop, Matt asked me to add an outlet on the outside of the coop. 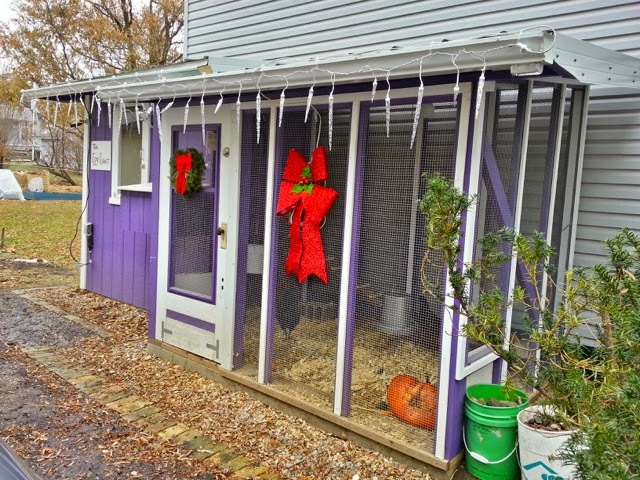 When asked why, he announced his sincere desire to decorate the coop for Christmas. I immediately added an outlet, and today, we have this. 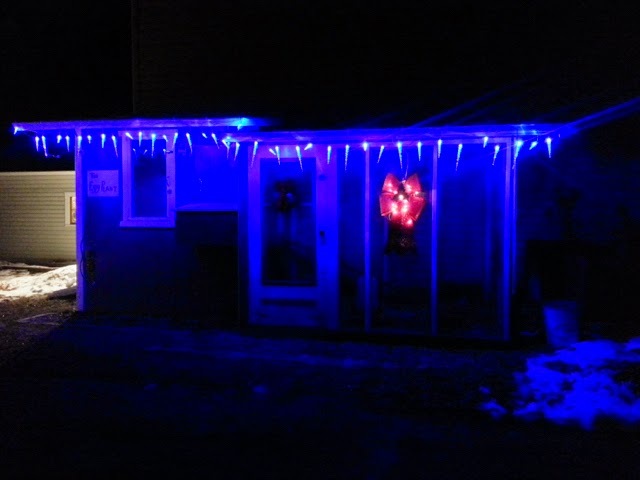 Thanks Matt for decorating! So far two of our chickens are laying eggs, even into these late and short winter days. 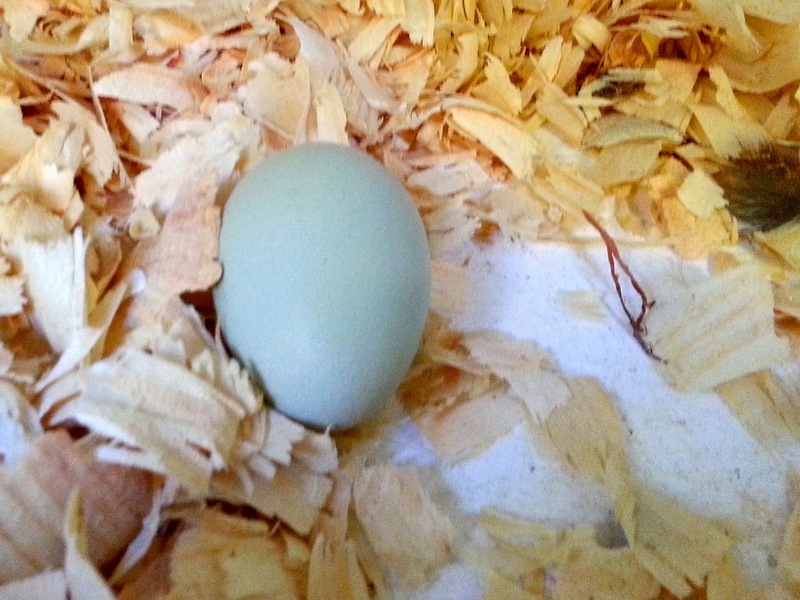 As previously announced, Betsy is laying the bluish eggs. 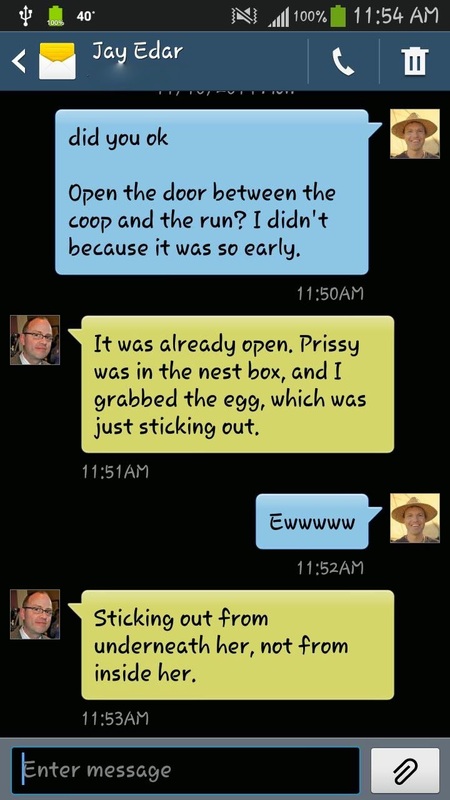 Since then, Prissy has started laying brown eggs. We know it's her because we've caught her in the next box. 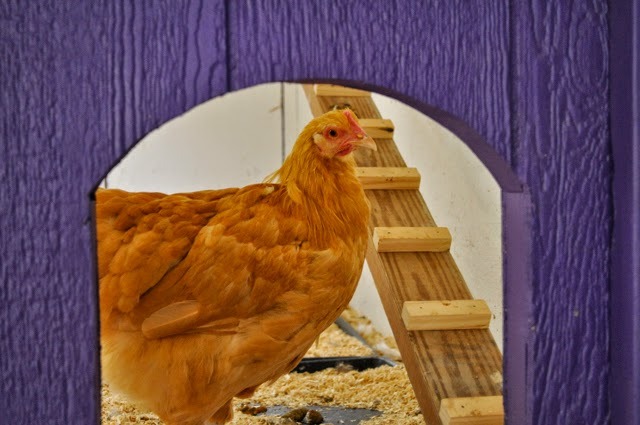 However, she has also laid eggs in the middle of the coop and in the run. Not sure why, when there are golf balls in the nest box to cue here where to lay! The other two birds might wait until next spring. 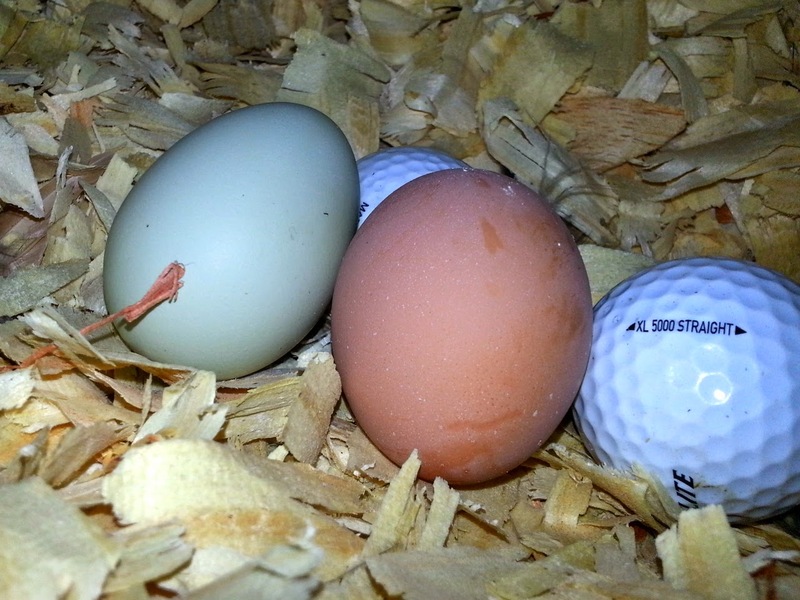 The golf balls help teach the chickens where to lay their eggs. "Use permaculture principles to create an urban orchard, store lots of water and build community." Saturday, Feb. 14, 4:45 p.m.
Sunday, Feb. 15, 2:15 p.m. These times may/may not change, but if you're interested in either seeing the presentation or simply going to the Expo, save the date. Here's a recap of what I thought of the expo when I went for the first time last year.